The women's race turned conventional wisdom on its head. It was supposed to be a 2 woman affair between Ethiopians Gete Wami (winner of $500,000 and the inaugural world inaugural World Marathon Majors title) and Berhane Adere (winner of $250,000 at the Dubai Marathon in January). It was anything but a 2 woman dual. The woman's pace started slow (17:37 thru 5k) and remained that way past half way as there was a big pack of more than 10 together (1:12:53). Soon after the pace got moving and there were only four up front, German Irina Mikitenko (2nd in Berlin in her debut last year, and the Letsrun.com long shot), Souad Ait Salem of Algeria, and the Ethiopians Wami and Adere. Order seemed to be restored as they ratcheted the pace up to 16:40 for the 5k from 20 to 25k (the previous 5k had been 17:19 for reference). But then the unexpected happened. First the pace began to slow (nearly a minute slower for the next 5k 17:34 from 25k to 30k) letting the Russians Ludmila Petrova and Svetlana Zakharova and the Kenyan Salina Kosgei back into the race. At the same time, Wami fell at a drink station. It was unclear exactly what happened but Wami said a runner fell in front of her and next thing she knew she was down as well. Wami fell hard hitting her face on the pavement. So hard that after the race she said, "When I first got up, the first thing I did was feel my teeth as I felt my teeth had fallen out (vide of Wami's comment at the bottom and here)". The dazed Wami dropped back and for a while appeared out of the race (probably at least 10 seconds back), but she was the class of the field and slowly she worked her way back up to the pack. At some point the beautiful weather turned to a cold rain, yet the pace increased due to the slow start (17:03 from 30 to 35k) and it was now a three woman race (Wami, Mikitenko, and Zakharova). It was a bold effort for Zakharova who many thought was past her prime. She looked to really be struggling and had originally fallen off the lead pack just past half way. Mikitenko however was feeling good and soon ended the race. She upped the ante from 35k to 40k running the 2nd fastest 5k of the race (16:41) and it was all over. She would go on to win comfortably in 2:24:14 while Zazharova was able to pull away from the struggling Wami (2:24:39 to 2:25:37) to get the surprise 2nd. 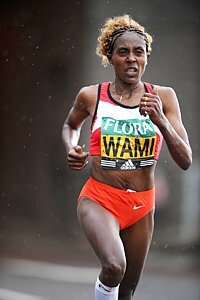 Wami had looked ok when she was running, but said the injury began to bother her more as the race went on. She limped noticeably after the race. Wami said, "As soon as I got up I didn't feel much pain. It was towards the end I began to feel a lot of pain...And then when the rain began it made everything worse." Fortunately she told race organizers she doesn't think it is a serious injury, "I don�t think it�s a bad injury, I will probably have some bruising there tomorrow." Wami kept her day in perspective, "I was disappointed at first, but now I am happy I was able to come back and finish 3rd." The day belonged however to Irina Mikitenko. She got a huge win for her career and was obviously pleased. Afterward, she made it clear that she felt she would have won regardless of Wami's fall, "I am a competitor. I know what I can do. It wouldn't have affected me. (I still would have won)." While very impressed with Mikitenko's win, we have to disagree with her a little bit and say we're not so sure she would have won . It's natural or Mikitenko to think she would have won but Gete Wami has historically been in another class from Mikitenko so it certainly wouldn't have been easy. It's impossible to predict how much nearly having her teeth knocked out in the race hurt Wami. Mikitenko looked very strong the last 5k and said the strong wind (and slow opening pace) caused her to miss her sub 2:24 goal.. She told organizers, "It was very windy all through the course and sometimes I had to close my eyes and run into the head wind. It�s only the second marathon I�ve ever run and I am so happy to get the win."